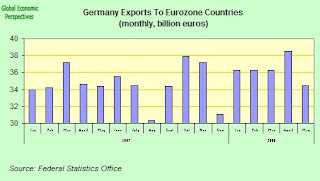 German exports declined the most in almost four years in May, as a slowdown in some key eurozone economies (Spain, Italy) and a stronger euro curbed demand. Sales abroad, adjusted for working days and seasonal changes, decreased 3.2 percent from April, the Federal Statistics Office said this morning. That's the biggest drop since June 2004. From a year earlier, exports rose 2.5 percent, today's report showed. The trade surplus narrowed to 14.4 billion euros ($23 billion) from 18.8 billion euros in April. Economists forecast a surplus of 17.3 billion euros. The surplus in the current account, the measure of all exports including services, narrowed to 7.5 billion euros from 15.5 billion euros in April. Exports within the eurozone were down to 34.5 billion euros in May, the lowest level since September 2007, and only up 0.5% on May 2007. This is obviously NOT an impact from the higher euro, but a knock-on effect of the Spanish and Italian slowdowns. Now given the structural export dependence of the German economy there is an inherent instability in the situation, ie German growth is more fragile and vulnerable than that of a domestic consumption supported one (like France say), and when the pack of cards folds, then it does tend to fold pretty quickly, which is why I am putting up the GDP and export growth co-movement chart (see below), since I think what we may well now see is a repeat of what happened at the end of 2001, when the sharp fall in the rate of increase in exports send headline GDP swiftly down. Basically not being able to fall back on domestic consumption is a tremendous liability, and again, there can be little fiscal support, if the German administration want to stick by their deficit ending commitments. German Finance Minister Peer Steinbrück is reported to be about to unveil an even tighter-than-expected 2009 budget in an attempt to stay on track with the target of completely eradicating the German federal deficit by 2011. The draft budget will be put to the German cabinet on Wednesday and is thought to envision total federal spending in 2009 of €288.4bn, up 1.8 per cent from this year. The deficit is forecast to fall by €1.4bn to €10.5bn. 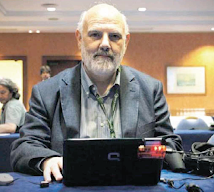 The finance ministry’s four-year fiscal plan is said to be little changed from earlier versions and foresees a fall in the deficit to €6bn in 2010 and zero from 2011 onwards despite an average yearly increase in spending of 1.5 per cent. Likewise I would also stress the high level of inter-locking with several key East European economies, and how developments there are also begining to grind German exports down. To put things in perspective a little, in 2007, and despite all the talk about the "China factor", Germany exported roughly the same quantity of products to the Czech Republic ( 26,026.6 million euro) - population circa 10 million - as it did to China (29,922.7) - population circa 1.3 billion. A detailed comparison of relative performance between 2006 and 2007 is even more revealing. Of particular interest is, for example, the fact that exports to China only increased by 8.7% in 2007 while exports to the Czech Republic rose at almost double the Chinese rate ( 16.9%). The importance of United States as an export destination, on the other hand, declined, since exports to the US were down from 78 billion euro in 2006 to 73.3 billion euro in 2007, a decrease of 6%. Exports to Poland (another important destination for German exports with 36 billion euro in 2007) were up 25.2%. Spain was also up considerably (as was Italy), rising from 42 billion euro in 2006 to 48 billion euro in 2007 (up 14.2%). The Russian Federation also stands out outside the EU, with exports there rising from 23 billion euro in 2006 to 28 billion euro in 2007, that is an increase of 20.6%. 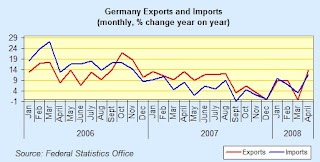 It is clear that the rate of increase of German exports to Russia has accelerated even further during 2008. Now Slovakia, Hungary and Romania all reported slowing industrial output for May yesterday. Slovak industrial output growth slowed to an annual 4 percent, Hungary's production rose at what was a reduced pace for them of 4.7 percent and Romanian output growth slowed to an annual 2.7 percent from 13.3 percent in April. Polish output only rose 2.3 percent in May, the slowest rate in three years, while the key Czech Republic is due to report tomorrow with some eagerly awaited numbers. This data, when put alongside Monday's industrial output data suggests that the German economy may well now be entering a significant slowdown. Basically, Southern Europe sneezes and Germany catches a cold, then the CEE economies cough and you get the full dose of pneumonia. 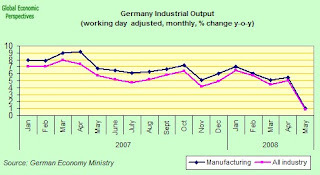 Does the May Industrial Output Drop Constitute An Early Warning Signal For A Coming German Recession? German industrial production declined for a third consecutive month in May, offering further evidence that Europe's largest economy is slowing, and reasonably rapidly. Seasonal and inflation adjusted output was down 2.4 percent from April, when it fell 0.2 percent, according to data from the Economy Ministry in Berlin this morning. That is the largest month on month fall since February 1999. 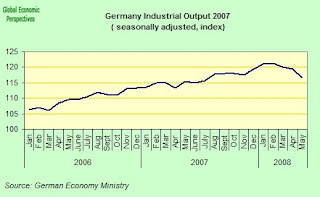 Output was up 0.8 percent on May 2007, on a working day adjusted basis. Manufacturing output was down 2.6% month on month, while construction was up 1% from April, but construction in April was already at a very low level. The seasonally adjusted industrial output index peaked in February, and has since been declining, as can be seen in the chart below. All the main sentiment indicators are now down (including the EU Composite Economic Sentiment Indicator, which came in at 101.5 in June, its lowest level since January 2006). 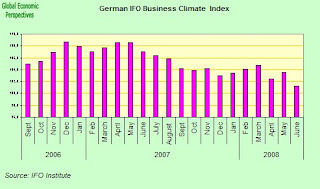 The latest Ifo institute business climate index fell to 101.3 in June (again its lowest level since January 2006) down from 103.5 in May, and the Sentix institute index (released this morning) fell to minus 9.3 from a positive 5.2 in June. That's the lowest since June 2005 and the biggest one-month drop since the start of the index in February 2001. 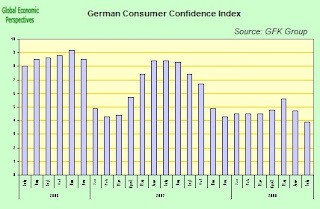 The GFK consumer confidence index was also down this month, with the forward looking index for July dropping to 3.9 from a revised 4.7 in June. Again this is the lowest reading in quite some time. In particular in their monthly report GFK highlighted how continuing high inflation was eroding income expectations and the consumer propensity to buy. According to the latest flash estimate from the German federal statistics office, inflation is thought to have hit 3.3% annually in June, and if confirmed his will be the largest price increase since December 1993. German job creation continued in May, although at a slightly slower pace than in previous months. From January to March this year, the number of persons in employment each month was by 1.8% higher than in the corresponding month of the previous year, while in April and May 2008 the increase had dropped slightly to 1.6% on April and May 2007. It is too early at this point to decide definitevely whether the current trend can be considered to mark a general slowdown on the labour market. At least part of the slowdown can probably be explained by the fact that the winter months had been unusually employment-friendly because of the mild weather, so that the usual upturn in spring was smaller, although of course this also means that growth in the earlier months of the year was not as stong as appears at first sight. So any definitive assessment of the state of the German labour market should be in "wait and see" mode at the present time, although the latest industrial output data make it hard to think that the labour market is not weakening. 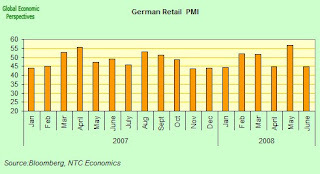 German retail sales also fell markedly in June, reversing from the sharp rise posted in May, according to the most recent reading on the Bloomberg retail PMI. The index slumped from the eighteen-month high of 56.6 achieved in May to 44.9. (The PMI measures the rate of expansion or contraction. According to the Federal Statistics Office data retail sales expanded rapidly in May - 1.3% in real terms over April - but now we seem to have an equally rapid rate of contraction going into June). The rate of increase in exports has been slowing of late, and all eyes must now be on the May data, which is due on Wednesday. The median of five GDP forecasts published by the German economic institutes in June predicts growth in the German economy this year of 2.2%. This really now seems a highly optimistic number, especially bearing in mind the economy may in fact have shrunk in the second quarter after expanding 1.5 percent in the first three months, according to the recent statement of Deputy Economy Minister Walther Otremba. So while it is early days yet to reach any firm conclusion I would say that the possibility that the German economy will enter recession at some point in 2008 has now risen to over 50%. 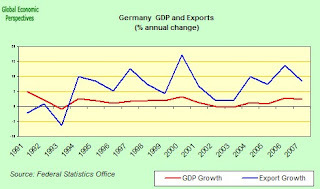 For more argumentation on this topic see my What Is The Recession Risk For The German Economy? on RGE Europe EconMonitor.